Final Fantasy XIV‘s Letter from the Producer Live at E3 2016 has wrapped! We’ve got a summary of all the major information below — where we got a look at a new upcoming feature called the Deep Dungeon, QA, details on FanFest goodies, and more! Regarding housing, the team prioritizes free company estates over single player housing — but they want to cater to the latter group. So in Patch 3.4, Apartments will be added to potentially fulfill 100% of the housing demand. Currently, if you see abuse of the housing system such as reselling houses for exploitative amounts of money, make sure to report it in-game to the support desk so that they can properly investigate and take action. The team is also planning to increase the amount of items that can be placed on/in a property, but details on when will come later. Player inventory and the armoury chest space will be significantly increased in the next expansion. There are no plans to nerf the amount of Mentor Roulettes needed to obtain the Astrope mount. Yoshida elaborates that if they were to nerf it, that people would use the Mentor Roulette to grind (and possibly rush) to get the mount rather than help people out — the purpose of the Mentor feature. They don’t want to use commendations since they skew towards tanks and healers. The team will consider a Savage mode difficulty of the Weeping City of Mhach later on when they have more wiggle room. 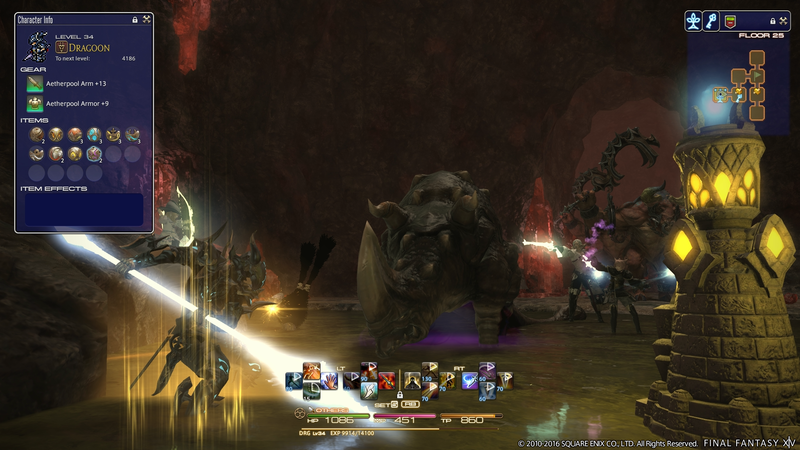 Yoshida says there’s a lot of debate on the difficulty, and they feel Void Ark (3.1) was too easy — citing the Crystal Tower series as a level of difficulty they want to hit. They want you to communicate strategy in the raids, whereas Void Ark felt like you could get by without. The team will continue to monitor the clear rate of the Weeping City before considering any nerfs. Ozma’s meteors may have been a little too hard. The Revenge of the Horde main story had a tighter focus on the story, leaving other storylines to sidequests. 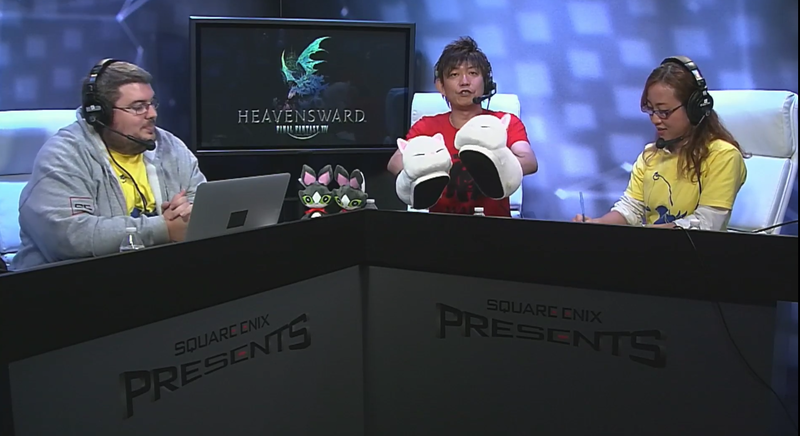 Yoshida feels they’ve found a good tempo by telling the story this way. For the expansion pack, they need the story quests not only to advance the plot but help characters level up. Players wanting to stack Timeworn Dragonskin Maps to farm the Aquapolis — it’s going to take time and effort to get them to work this way, but they’ll consider developing it. Mounts that have special actions during quests but not when you unlock them will be addressed one by one to have that added. The team will consider an alliance raid roulette where you could queue for the 24-man content such as the Crystal Tower and Mhach series. 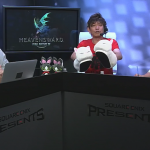 Yoshida mentions that the housing team is watching and to listen to a player request to add a stage for furnishing items. Players have been requesting an “RP” (roleplaying) icon for characters that are roleplaying in-character. Yoshida adds that they’ll add it to the UI team task list. 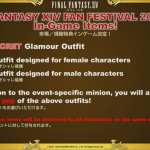 The team will consider rotating MGP bonus events in the Manderville Gold Saucer. New sleeping poses will be added in Patch 3.35 (in less than one month) — there’s a lot of them and the animation team has been working on them for a while. Each race/gender will get two new poses. Regarding RMT harrassment via /shout and /tell, the team is planning to add functionality that will flag RMT to be sent to an in-game jail with accumulating reports. It’s a system similar to one used in Dragon Quest X.
Sleipnir is on the list of mounts that will gain the ability to fly. The Palace of the Dead Deep Dungeon will arrive in Patch 3.35. You must be level 17 to unlock it. You’ll need to travel to Quarrymill in the South Shroud to interact with the NPC that manages it. Talking to the NPC in Quarrymill will allow you to access two save slots for your progress. You can also use a Finder (not the Duty Finder) to match yourself with other players who have progressed to the same floor. Mind, you can end up with parties of four healers or four DPS — the content isn’t designed to require the typical Light Party composition. You start out at Level 1 in the dungeon and the gear you’ve collected outside the dungeon will not count towards your power. You will have a weapon and armor exclusive to the Deep Dungeon that can be powered up over time. If you power the weapon up a certain way, you’ll be able to bring it to the outside world as a reward. The floors are randomly generated and may have different restrictions like the inability to use items or Sprint. Every ten floors there will be a boss fight — after which you’ll be able to save your progress. If you wipe before then you’ll have to restart from your last save. In Patch 3.35 there will be 50 floors and more will be added in the future — up to 100, and 200 as a “stretch goal”. There will be items you can use that are Deep Dungeon specific and have their own inventory. Keep in mind this item inventory is shared with your whole party. You can open treasure chests to obtain Deep Dungeon items or power up your weapon and armor. However they may be booby-trapped! By interacting with an ankh, you can advance to a deeper floor. However, all party members have to be alive and standing within range to proceed. You can use certain items to transform into monsters like Succubus and Manticore. You can use their abilities to great effect. You’ll get to level 60 by around floor 40 or so — you’ll be able to use all the abilities for a class or job regardless of quest progress. Deep Dungeon gear you power up can be used in your second save file — for a solo attempt perhaps. There are no daily nor weekly lockouts for Deep Dungeon attempts. 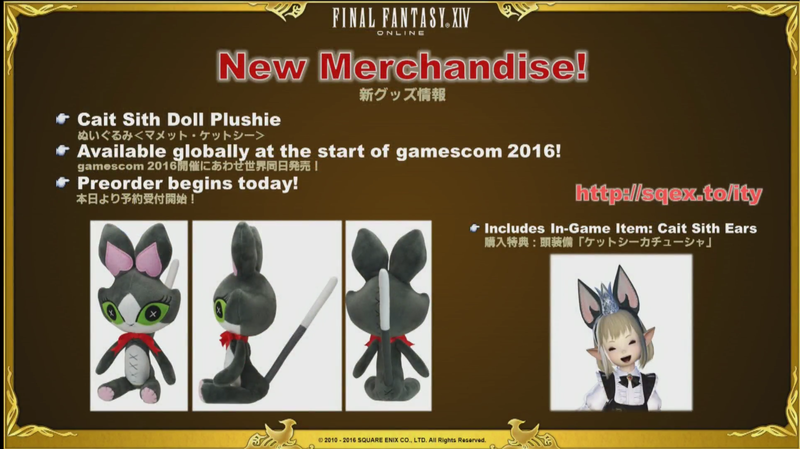 Cait Sith Doll Plushie (pictured below) will be available globally at gamescom, and will include in-game Cait Sith Ears. Preorders begin today! 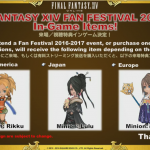 In-game items for Final Fantasy XIV Fan Festival attendance include minions based on Final Fantasy X characters. By either attending in-person or purchasing the paid stream, you can obtain these minions by region. 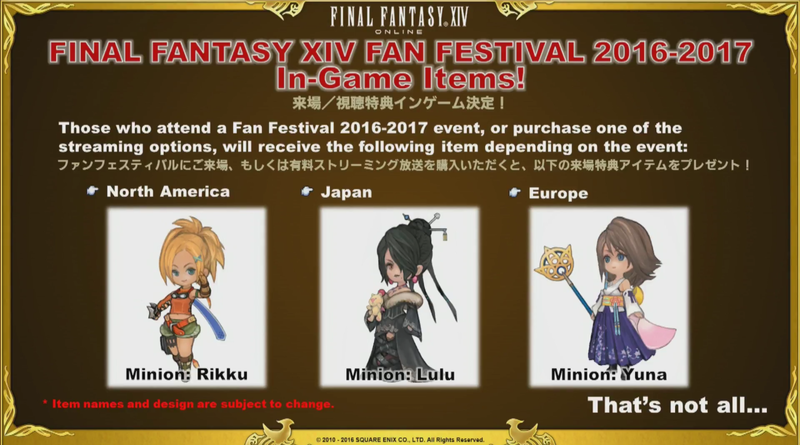 Rikku is available for North America, Lulu for Japan, and Yuna for Europe. 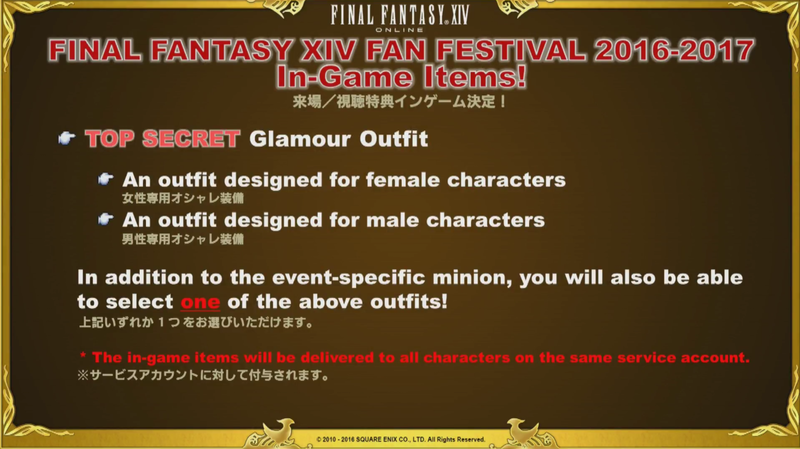 There’s also a top-secret glamour for male or female characters that will be revealed later on. 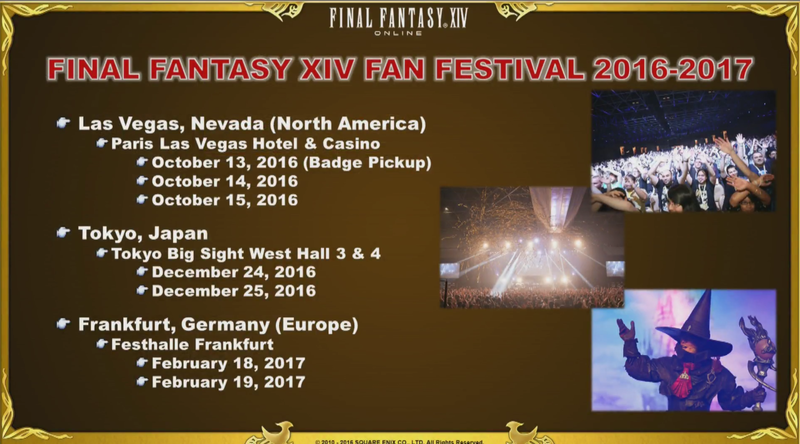 Active subscribers to Final Fantasy XIV between May 1 2016 and June 6 2016 will get an email (check you inbox now) regarding ticket sales for Fan Festival. Presale begins next week. More here. 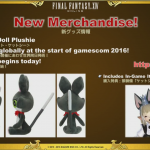 Moogle slippers are merchandise in development. 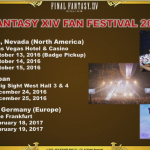 Posted in E3 2016, Final Fantasy XIV, Headlines. Just keep asking, it might help!